Do you really need life insurance? If you struggle with this question, you’re in good company. It doesn’t help that insurance agents are often perceived as pushy sales people who stand to make larger commissions if they sell more expensive products. It is true that some insurance agents are commission-hungry. But I think it also is common for people to dismiss good insurance advice due to the perceived conflict of interest. Often, you do need life insurance. Life insurance is often absolutely necessary for a family to be financially secure. If you have anyone depending on your care and/or your earned income, you need life insurance. Dependents can include a spouse, a child, or even a parent. At the same time, it’s important to choose the right kind and amount. Think about a family with $5,000 of monthly expenses, all covered by a single income. To continue covering those expenses for 20 years after the earner’s death, the family would need to have about $900,000 to invest, assuming a 5% after-tax return and 2% inflation. That’s more cash than most people keep lying around, especially in the early stages of adulthood. It’s not only the income earner that may require life insurance. In a single-income family, one spouse may be at home caring for children and managing the household. Those functions have monetary value; one way or another, that value needs to be replaced on the death of the spouse providing it. When a family is just getting started, the biggest expenses usually involve things like mortgage payments, retirement savings, and childcare. Accumulated financial assets tend to be low. With high expenses and a heavy need for a reliable income stream, most younger families should have life insurance. At retirement, human capital is considered to be depleted, and you should be able to rely on your accumulated financial assets like pensions and investments to fund your lifestyle. Your ability to generate income is less critical at this stage, as your family will probably be okay financially if you die. So, life insurance needs are typically highest (and, thankfully, most affordable) at the start of adult life. Those needs usually decline over time until retirement, when they approach zero for most people. Thus it is extremely important to choose the right kind of life insurance during various stages in your life. There are two main types of life insurance: term and permanent. Within each category, there are quite a few variations in terms of cost and structure. Term life insurance is usually the most affordable. It’s also probably the most sensible choice for most young families. It’s structured and priced to run out of steam at around the same time you no longer need it, as described above. With term insurance, you lock in your premium (the cost of the insurance) for a fixed number of years (the term). At the end of the term, your premium will go up – usually by a lot. So ideally, you want to purchase a policy with a term that covers the duration of your insurance need. For example, it’s prudent to buy a policy with a term that will cover you until your kids are expected to be independent, or until your mortgage is paid off. Term insurance policies come in many durations, but the most common are 10 and 20 years. Permanent life insurance does not renew or expire the way term insurance does. As long as you pay all your premiums, it is essentially guaranteed to pay out eventually when you die. Check out my video for more details on each. But in general, the differences among them typically involve different sorts of pay-out terms, different schedules for paying your premiums and different methods for doing so. For example, some permanent policies include an investment component. Others offer policy dividends, and/or a bank-like cash value you can tap into after a while, to pay off the premiums for you. Often, you also can overfund a permanent insurance policy (up to a limit) by adding cash in excess of the premiums. The extra cash can then grow tax-free inside of the policy. While this may be interesting to some people, in general I would not say that permanent insurance is a very good investment. It usually entails high built-in costs and liquidity restraints (i.e., it locks up your money). You’re probably better off investing any extra cash you have in a basic, cost-effective investment account – maybe a TFSA. There, your assets should be better positioned for investment growth. If you end up needing the money to fund your insurance premiums, you can still tap into it, but neither have you ruled out readily using it for other purposes. For most people in most situations, term life insurance is the simplest and most cost-effective option. For example, the $900,000 policy that I mentioned would cost about $40 per month for a 30-year old female. On the other hand, structuring this policy as a non-participating whole life policy would cost around $400 per month. Still, permanent insurance might be the policy of choice when there is a specific need at death, and/or estate assets may not be readily available due to liquidity restraints. For example, a family cottage passing from parent to child may result in a substantial tax bill. If there are no other liquid assets in the estate, and the child cannot afford to pay the taxes on their own, the cottage may need to be sold. Permanent insurance could be used to avoid this situation. 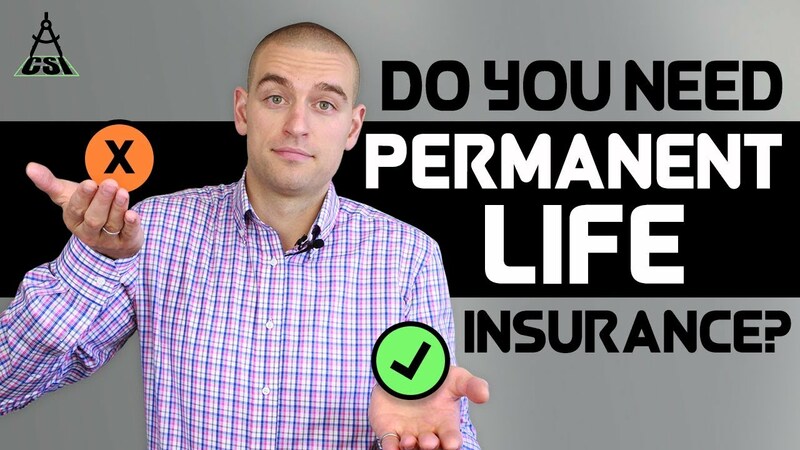 In her “No Dumb Questions video on life insurance, my PWL colleague Nancy Graham describes permanent insurance as being for “when you die” versus “if you die” kinds of funding needs. Remember, not all insurance agents are out to sell you the most expensive product. I’ve met plenty of honest, hard-working agents who seem as committed as I am to helping people find the right, common-sense fit for their insurance coverage. That said, as you survey the field, I recommend you employ solid due diligence and obtain objective second opinions if you’re able. For example, consider that $900,000 policy mentioned above. An insurance agent is usually looking at around a $500 commission for the term policy, versus a $5,000 commission for the permanent policy. If you opt for the permanent policy, are you doing so for the right reasons? Have you purchased permanent life insurance instead of term? Tell me why in the video comments. Born and raised on Vancouver Island, BC, Benjamin completed a degree in mechanical engineering before pursuing a career in financial services via the MBA program at Carleton University’s Sprott School of Business. Get more from Cameron, Benjamin and the team.